ANTaR ACT, Amnesty ACT/NSW and the ANU Law Reconciliation Action Plan Committee joined forces to host the Imagining a different justice future for Indigenous Children in the ACT Forum on 30 May 2016. The forum was organised to explore supporting community initiatives and practical ways to deal with the high adult incarceration rates in the ACT whilst at the same time acknowledging some of the successes achieved in the reduction of young people Indigenous Australians in detention. It brought together the Minister for Indigenous Affairs Chris Bourke, the Shadow Minister for Indigenous Affairs and Corrections Andrew Wall and Greens MLA and Minister for Corrections Shane Rattenbury with community members Traci Harris (Women’s Legal Centre and former member of Galambany sentencing court), Dr Paul Collis (member of Galambany) and Wayne Applebee (former member of Galambany sentencing court), along with scholars including Dr Anthony Hopkins (ANU Law, impacts of sentencing on Indigenous Australians), Dr Lorana Bartels (UC Law & Justice, Indigenous people and the criminal justice system), Dr Tony Foley (ANU Law, restorative justice and Indigenous youth incarceration) and Jeremy Boland (former ANU Law, prisons project). 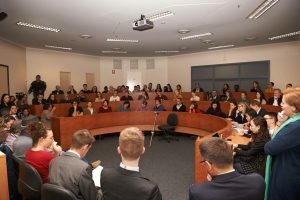 The forum was moderated by Mary Spiers Williams (ANU Law) who expertly enabled the conversation to flow as questions were asked by members of the audience and students from the ANU Law Reform Social Justice Group and Amnesty International groups at ANU/UC. What is the current situation regarding the impact of the criminal justice system on young Indigenous Australians in the ACT? Will reducing the incarceration rates result in the increased victimisation of Indigenous women and children? What initiatives can counter the negative impacts of the criminal justice system in court, prisons and initial contact with police? What policy positions do the various parties have on these issues and are any attempts being made to develop a tri partisan (Labor, Liberal and Greens) approach? The forum was incredibly well attended and filled to capacity on a cold, wintry Canberra night. Discussion centred on the successes achieved by the ACT in the area of Indigenous youth incarceration, including a 47% reduction in 2013-14, and how these might be extended for adults. The Minister for Indigenous Affairs cited recent initiatives that have been introduced or are being considered in the ACT including pre-sentencing reports that inform the court on links between a defendant’s offending and their Indigenous status, increasing the availability of programs that Galambany sentencing court can direct offenders to and making the Galambany sentencing court available to adult offenders as a restorative justice measure. Wayne Applebee, P aul Collis and Traci Harris talked about their experience with Galambany sentencing court, and how it engages people to see how their behaviour affects the community and how they can take responsibility – it is important for re-engaging with their mob, without shaming. Anthony Hopkins talked about recent developments for considering Indigenous identify in sentencing and reminded those present of the need to contextualise Indigenous offending within the framework of colonisation and the impacts that are still with us. He said that it was about not looking at this as the person’s problem but as the community’s problem and how sentencing can change this. In response to questions about whether reducing incarceration rates would increase domestic violence, Traci said that violence is related to the intergenerational trauma that followed from colonisation, and that solutions should focus on access to resources to decrease violence – locking up is not the solution. Mary noted that there can be a misunderstanding behind efforts to reduce incarceration – it is not about just letting people out, but reducing the underlying causes. In general, all those present agreed with many of the measures and issues being discussed. There was agreement from all politicians that it is important to reduce incarceration of Aboriginal and Torres Strait Islanders. However, they also agreed that there was not a need for a tri-partisan approach on how to do this, but rather that the best ideas can emerge from debating different ideas. Feedback from participants and attendees was positive and there was wide support to continue the discussion and keep the focus on these issues in future forums and events. This was just a start and there were many issues, such as the removal of children, that were raised but could not be explored fully in the evening. 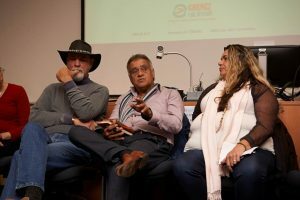 The event was covered in the media by local ABC news (see story here: http://www.abc.net.au/news/2016-05-31/indigenous-incarceration-rates-forum-canberra/7460982) and on SBS Living Black Radio.